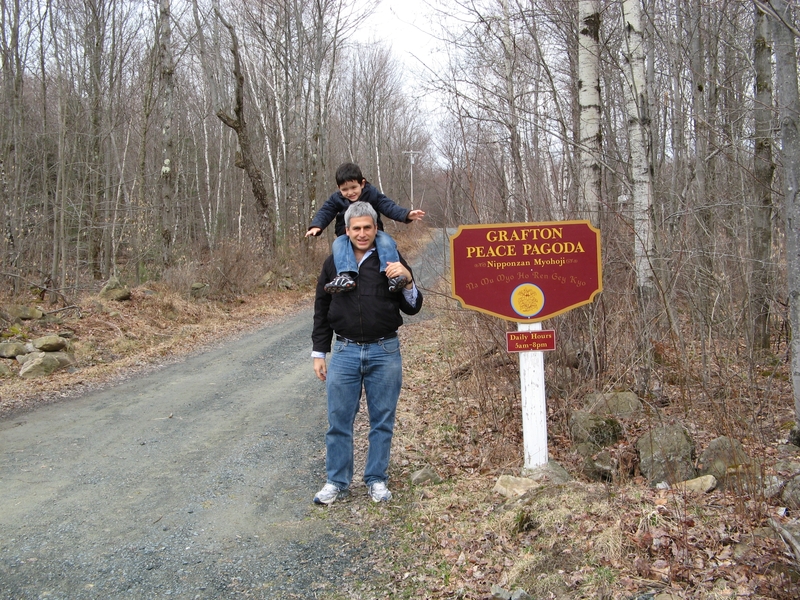 Life is a river | Jon Katz, P.C. 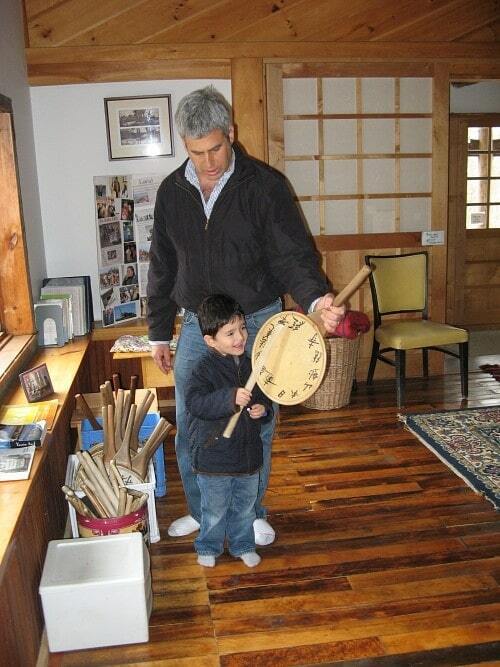 Drumming up peace in the temple, with my boy (Copyright Younghee Katz). 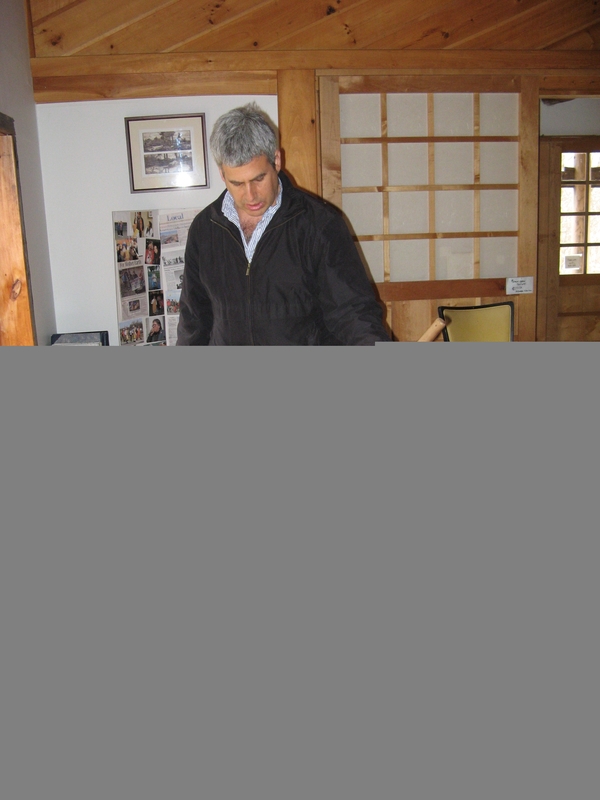 The rustic setting is offset by a soothing woodfired traditional Japanese bath up the road and behind the temple. (Copyright Younghee Katz). 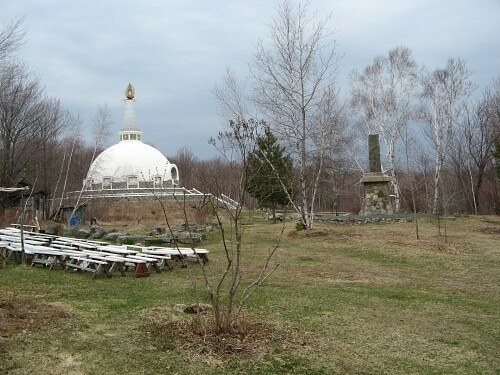 Last weekend was my fourth trip to my friend and teacher Jun Yasuda’s awe-inspiring peace pagoda and serene temple in rural Petersburg, New York (pictured above), east of Albany on the other side of the Hudson. This was the first time I went along with my wife and son. No matter one’s religious or non-religious focus, the visit for many people is calming and harmonizing, to the point that my law school friend’s otherwise constantly friendly-hyper dog even went serene on first seeing the pagoda. I write here about my first journey to Jun Yasuda and the now-replaced temple and pagoda in 1996. The above pictures are displayed in reverse chronological order. Starting at the bottom is the welcome sign to the temple grounds, where people park unless they have handicaps that necessitate driving closer. Next is a view inside the main room of the temple, which building also contains sleeping quarters and a large kitchen. This and all Nipponzan Myohoji temples include a large prayer drum and hand-held drums of the sort pictured, for chanting the Odaimoku of Na-Mu-Myo-Ho-Ren-Ge-Kyo, which is at once a profound prayer for peace and the essence of the Lotus Sutra. Like most traditional drums, they are made from animal skin, which challenges my veganism. Next comes our walk up the steps to the pagoda, which is an empty structure that Jun Yasuda relates contains relics of Buddha Shakyamuni. Above that is a view of the pagoda and the surrounding grounds. The benches in the foreground are on the right side of the temple, suitable for such gatherings as annual celebrations of the Buddha’s birthday. At the top is the English description of the last or second to last of the eight or so reliefs on the sides of the pagoda that tell the short story of the life of the Buddha. For a YouTube video of the pagoda, see here. The top picture above shows a sign at the pagoda that claims the Buddha’s last words were the following haiku: “Life is a river/ Always moving. Do not hold / onto things. Work hard.” A google search suggests that other Buddhist traditions might differ over the content of his last words. The first line of the Buddha’s last words depicted above is significant both to Buddhism and the t’ai chi Chinese martial art that I practice. Life constantly changes, just as a river does, which highlights the impermanence of life that is a focus of Buddhism, and the need in t’ai chi to work with change at every turn and never to fight the change with hard energy. The admonition “do not hold onto things” is part of the Buddhist focus of non-attachment in such areas as non-attachment to our bodies, personal relationships and possessions; and letting go our desires and expectations of ourselves, others, and circumstances. Similarly, t’ai chi teaches its practitioners to empty the clutter in their minds. 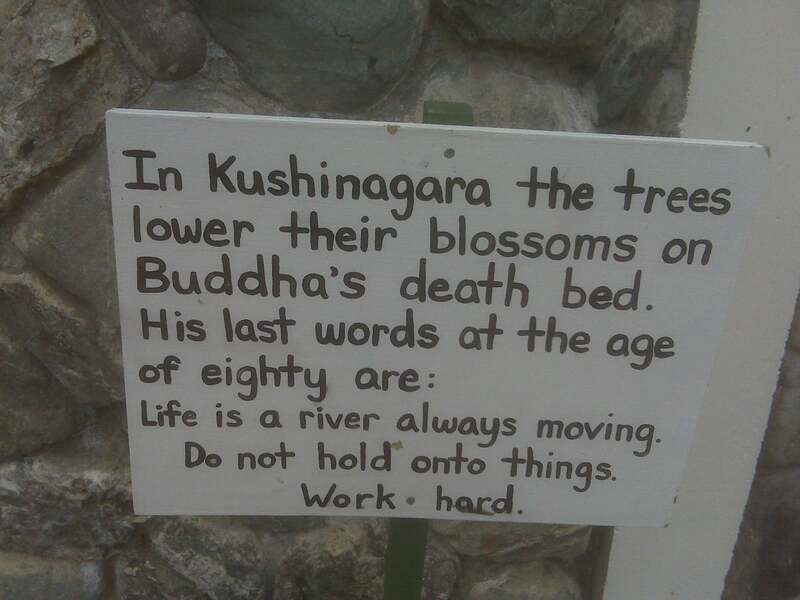 The final sentence “work hard” reminds me of a story of t’ai chi megamaster Cheng Man Ch’ing, who once pointed out to his students while on a walk that they have plenty of time in the future to rest (gesturing towards a cemetery) but that much is left to be done while on this Earth. ADDENDUM I: Speaking of t’ai chi, here is my t’ai chi update: This weekend, I returned to the weekly Saturday morning t’ai chi push hands practice on Capitol Hill, where I learned more about neutralizing the opponents’ push through softening the body, dealing with the ever-changing river of surrounding challenges and pushes, generally moving with a circle as part of one’s defense, and sinking into the ground when doing the press and push hands moves. Also, I got two excellent books in the mail this past week to add to my t’ai chi library. The first is Wolfe Lowenthal’s second entry of his two-volume biography of his teacher Cheng Man-Ch’ing: Gateway to the Miraculous: Further Explorations in the Tao of Cheng Man Ch’ing, which follows Lowenthal’s There Are No Secrets: Professor Cheng Man Ch’ing and His T’ai Chi Chuan. Among Wolfe’s interesting disclosures in Gateway to the Miraculous is his heavy antiwar activity. Paul Krassner says Lowenthal was a Yippie organizer. At the Chicago Seven trial, the late singer Phil Ochs testified about having been arrested at the 1968 Chicago Democratic convention along with Lowenthal, a pig, Jerry Rubin, Stew Albert, and three others. Cheng Man Ch’ing followed both Confucius and Lao-tzu (whose Taoism heavily influences t’ai chi), the latter being said to have been the author of the central Taoist book entitled the Tao Teh Ching. According to Mark Hennessy’s translation of Professor Cheng’s Master of Five Excellences, Professor Cheng once reviewed all translations of the Tao Teh Ching and I Ching (Paul Gallagher calls the latter book “the central source book for all Chinese Philosophy and Science”) at the Columbia University library, only to find them all “translated completely wrong.” Therefore, I went out of my way to obtain Cheng Man Ch’ing’s commentaries on the Tao Teh Ch’ing, which is entitled My Words are Very Easy to Understand. The volume is an English translation by Professor Cheng’s late interpreter and disciple Tam Gibbs both of the Professor’s commentaries and of the original text of the Tao Teh Ching, which suggests that it might be a reliable translation. If you know of a reliable translation of the I Ching, please let me know. ADDENDUM II:On April 27, I e-mailed the above-discussed Wolfe Lowenthal, who confirmed that he very much likes Richard Wilhelm’s translation of the I-Ching. Carl Jung writes the foreward to Wilhelm’s translation.